The best butterfly of the past week was an Eastern Tailed-Blue on Kent Island, just south of Grand Manan. It was found by Roy Lapointe and seen by many members of the Saint John Naturalist Club. 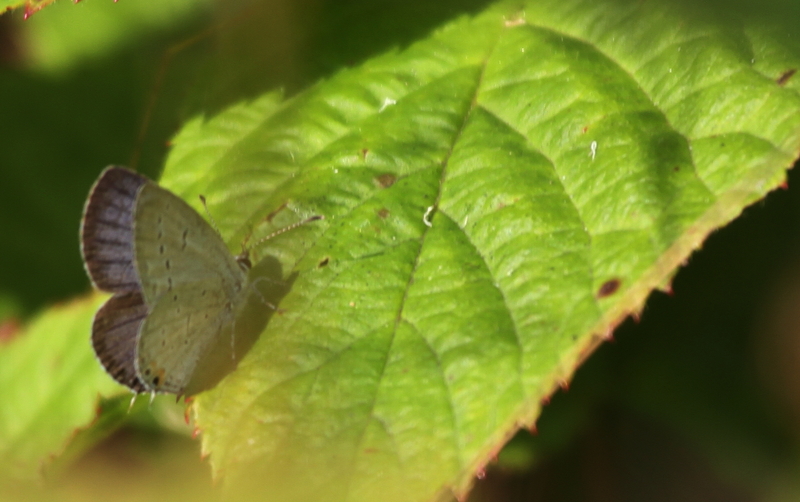 In the Maritimes, Eastern Tailed-Blue is known only from western and southern New Brunswick and, as mentioned in the last post, this species is seen regularly on Grand Manan in September. This is the first record of Eastern Tailed-Blue for the Atlas – good work Roy! Eastern Tailed-Blue, Kent Island, Grand Manan, September 4, 2011. Photograph by Merv Cormier. There were a couple more Common Buckeyes this week on Grand Manan, both found by Roy Lapointe. I’ve never been to Grand Manan late in the season, I’ll have to put it on next year’s to-do list! Other species seen in the past seven days include Clouded Sulphur, Cabbage White, Question Mark, Red Admiral, American Lady, Viceroy, American Copper, Black Swallowtail, and Monarch. In keeping with the rest of the summer, these species are only being seen in small numbers.